Torq-Masters Industries only sells products we test, race prove and would recommend to our customers. 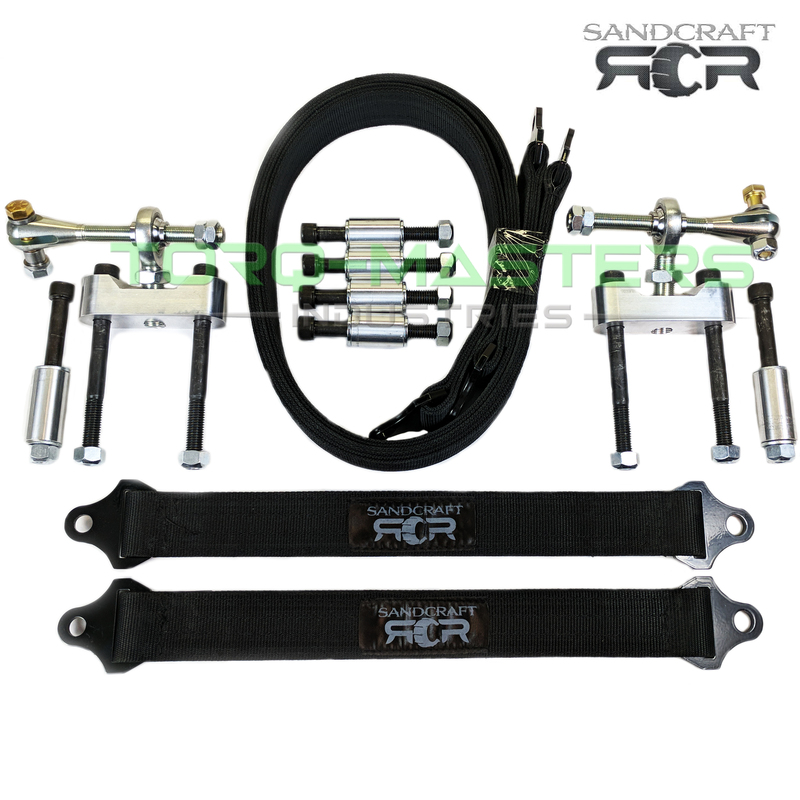 SandCraft's Off-road limiting straps protect your axles & suspension components by preventing the over extension of your CAN-AM X3 suspension. The easy to install kit adds cushion when the suspension fully droops out and protects the shocks, cv’s/axles, & steering components from damage caused by over extension. Don’t let your axles pop out of the differentials EVER AGAIN! 1) PUT CAR ON JACK STANDS SO ALL 4 WHEELS ARE OFF THE FLOOR AND MAKE SURE THE CAR IS STABLE. 3) STARTING FIRST IN THE FRONT, REMOVE THE TWO DRIVER SIDE SWAY BAR MOUNT BOLTS. ANGLE) PLACE THE NARROW SIDE TOWARDS THE WHEEL SIDE. 6) INSTALL THE SUPPLIED M12 X130 MM LONG BOLTS WITH ALL METAL LOCK NUT. SUSPENSION DROOP IN THE FRONT. NUT ON TO THE END OF THE SECURING THE LIMIT STRAP,SPACER AND SHOCK. THE ALL METAL LOCK NUT TO SECURE THE LIMIT STRAP, SPACER, UPPER SHOCK TOGETHER. 13) REPEAT STEPS 11 AND 12 ON THE PASSENGER SIDE.